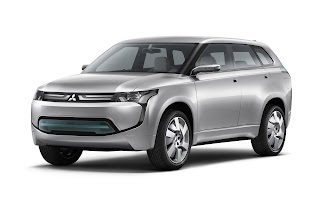 Mitsubishi’s plug-in hybrid SUV will be launched in 2013, according to Yoshikazu Nakamura, senior executive officer of Mitsubishi Motors Corp.'s global electric vehicle business. He said that the SUV will be similar to the Px-MiEV concept car displayed at the 2009 Tokyo auto show. He indicated that the plug-in hybrid is in its final stages of development. The four-wheel-drive Px-MiEV concept features a 1.6-liter four cylinder partnered to a hybrid system with two electric motors -- one for the front wheels and one for the rear. Back then, Mitsubishi has claimed that the Px-MiEV could be driven up to 30 miles in electric mode before switching to gasoline-electric mode. Mitsubishi said that it will produce its i-MiEV electric vehicle in only three West Coast states and Hawaii when it starts selling in the US in November 2011. Mitsubishi had also revised the name of the vehicle for the US market. It used to be known as the i-MiEV but it is now called the "i powered by MiEV." The i will be a 2012 model. Nakamura said that on its first year of sales in the US, 43 Mitsubishi dealers in California, Washington, Oregon and Hawaii will sell the i. Nakamura said that Mitsubishi hasn't named its plug-in hybrid SUV, but it will have the "MiEV" moniker. MiEV stands for "Mitsubishi innovative electric vehicle."